The End of Coal: How Should the Next Government Respond? Coal, for decades one of the “certainties” of Australian politics, is in terminal decline. This economic, environmental and geopolitical fact is now beyond dispute. Whoever wins the coming Federal Election will have no choice but to deal with the beginning of the end of coal, with power stations and mines closing and companies walking away or going bankrupt. Yet the issue is barely on the political agenda. How should governments respond to coal’s rapid and terminal decline? How fast will it happen, and should it be held back or accelerated? How should the decline be managed? Who should pay to support workers left behind? And who should pay for rehabilitation of mine sites and power stations? When it comes down to it, will governments and corporations act to protect people and the planet, or will they try to extract the last drops of profit from coal before it is left it behind? The case set out in the following papers is not only that change is coming, but also that, if we embrace and accelerate that change, it brings with it tremendous opportunities to build a better, fairer democracy, economy and society. 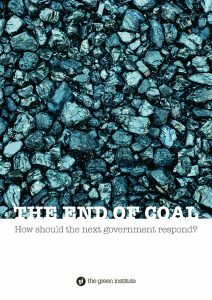 Full paper: The End of Coal: How Should the Next Government Respond? Renew Economy opinion piece: How did we get here? Photo Source: ‘Coal’ by Bart Bernardes from Flickr.